Demand for U.S. Debt Is Not Limitless - Miata Turbo Forum - Boost cars, acquire cats. The conventional wisdom that nearly infinite demand exists for U.S. Treasury debt is flawed and especially dangerous at a time of record U.S. sovereign debt issuance. The recently released Federal Reserve Flow of Funds report for all of 2011 reveals that Federal Reserve purchases of Treasury debt mask reduced demand for U.S. sovereign obligations. Last year the Fed purchased a stunning 61% of the total net Treasury issuance, up from negligible amounts prior to the 2008 financial crisis. This not only creates the false appearance of limitless demand for U.S. debt but also blunts any sense of urgency to reduce supersized budget deficits. Still, the outdated notion of never-ending buyers for U.S. debt is perpetuated by many. For instance, in recent testimony before the Senate Budget Committee, former Federal Reserve Board Vice Chairman Alan Blinder said, "If you look at the markets, they're practically falling over themselves to lend money to the federal government." Sadly, that's no longer accurate. 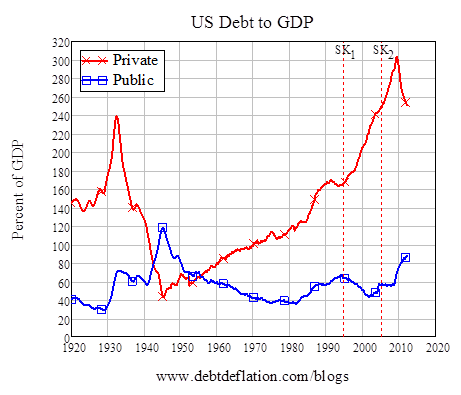 It is true that the U.S. government has never been more dependent on financial markets to pay its bills. The net issuance of Treasury securities is now a whopping 8.6% of gross domestic product (GDP) on average per annum—more than double its pre-crisis historical peak. The net issuance of Treasury securities to cover budget deficits has typically been a mere 0.6% to 3.9% of GDP on average for each decade dating back to the 1950s. 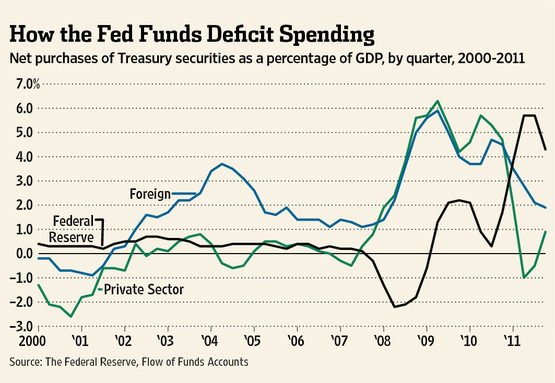 But in recent years foreigners and the U.S. private sector have grown less willing to fund the U.S. government. As the nearby chart shows, foreign purchases of U.S. Treasury debt plunged to 1.9% of GDP in 2011 from nearly 6% of GDP in 2009. Similarly, the U.S. private sector—namely banks, mutual funds, corporations and individuals—have reduced their purchases of U.S. government debt to a scant 0.9% of GDP in 2011 from a peak of more than 6% in 2009. The Fed is in effect subsidizing U.S. government spending and borrowing via expansion of its balance sheet and massive purchases of Treasury bonds. This keeps Treasury interest rates abnormally low, camouflaging the true size of the budget deficit. Similarly, the Fed is providing preferential credit to the U.S. government and covering a rapidly widening gap between Treasury's need to borrow and a more limited willingness among market participants to supply Treasury with credit. The failure by officials to normalize conditions in the U.S. Treasury market and curtail ballooning deficits puts the U.S. economy and markets at risk for a sharp correction. Lessons from the recent European sovereign-debt crisis and past emerging-market financial crises illustrate how it is often the asynchronous adjustment between budget borrowing requirements and the market's appetite to fund deficits that triggers a shock or crisis. In other words, budget deficits often take years to build or reduce, while financial markets react rapidly and often unexpectedly to deficit spending and debt. Decisive steps must be implemented to restore the economy and markets to a sustainable path. First, the Fed must stabilize and purposefully reduce the size of its balance sheet, weaning Treasury from subsidized spending and borrowing. Second, the government should be prepared to lure natural buyers of Treasury debt back into the market with realistic interest rates. If this happens, the resulting higher deficit may at last force the government to make deficit and entitlement reduction a priority. First and foremost, however, we must abandon the conventional wisdom that market demand for U.S. Treasury debt is limitless. Mr. Goodman is president of the Center for Financial Stability and previously served at the U.S. Treasury. OK, Scrappy, let's talk through this article. 1. He is drawing conclusions based on an incorrect premise -- particularly the idea that the US Government "has never been more dependent on financial markets to pay its bills," which neatly dodges the fact that the debt sales aren't funding anything, they're simply a self-imposed rule carried over from the gold standard. The bills are paid the same way the government pays for anything -- by creating the money. 2. Additionally, comparisons to European debt defaults fail because EU nations are currency-users, not currency-issuers. Their debt must be repaid in what is essentially a foreign currency; our debt (well, almost all of it) is held in our own currency. I may link my GF to this, buckle up. Your points 1 and 2 cover the important majority. I would also wager that most, if not all, of the emerging market countries he might reference would have also ceded their monetary sovereignty via a currency peg (usually to the dollar). Ironically, you could also interpret his article as essentially quashing the notion that market forces (aka bond vigilantes) - and not the US (or Japanese or Canadian or UK or Australian, et al) government - control interest rates and can force a US Treasury "bubble" to burst via demanding higher interest rates than the government wants to pay. I would love to take your girlfriend to a long lunch, Hustler. Somehow I imagined it would generate more discussion when I defended the MMS position in order to criticize a typical "Doom is coming if we don't shrink the deficit" article. Is nobody else interested in this stuff? I think the only other person that is interested in it at a higher level than TV soundbites is Jason and - he can correct me if I'm wrong - he rejects most or all of the operational premises your position is built on. For example, Braineack has said he prefers hyperbole and simple graphs over accurate understanding of a complex system. I can't really fault him for that. Most people just don't have the time or interest to invest in "unlearning" most of the wrong stuff they've internalized over the years or trying to learn new things that are very counter-intuitive. I still haven't put the time I'd wanted into studying MMT but from what I have gleaned, it explains how and why the system has been kept together for so long, but I reject the idea that top-down control is desirable and better than a de-centralized competing-private-currencies system. I also reject the idea that gov't spending beyond the basic protection of individual and property rights is good. Last edited by JasonC SBB; 03-30-2012 at 06:33 PM. I am re-posting this here, but deleting the quote tags to make it easier to read. Empirically, the money multiplier framework has failed miserably for a few years now. The fact that so many still espouse this idea could be the best example of Keynes’ famous saying: “Practical men, who believe themselves to be quite exempt from any intellectual influence, are usually the slaves of some defunct economist.” In this case, they are slaves to some defunct textbook which pushes an analytical construct that no longer applies in the current institutional environment. The results in this paper suggest that the quantity of reserve balances itself is not likely to trigger a rapid increase in lending. To be sure, the low level of interest rates could stimulate demand for loans and lead to increased lending, but the narrow, textbook money multiplier does not appear to be a useful means of assessing the implications of monetary policy for future money growth or bank lending. In fact, the level of reserves hardly figures in banks’ lending decisions. The amount of credit outstanding is determined by banks’ willingness to supply loans, based on perceived risk-return trade-offs, and by the demand for those loans. The aggregate availability of bank reserves does not constrain the expansion directly. Plus I'm borderline mentally retarded, but that only helped with my MENSA membership. Where will the Federal government get the US dollars to pay for Social Security benefits in the future? Where will your local bowling alley, football stadium or baseball park get the points to add to player's or team's scores? And if the gov't keeps increasing spending as a % of GDP, how will said data entry not dilute the value of the USD in the hands of the common man? This gets to the heart of a better discussion, which is inflation. Disclaimer: I certainly don't have even half of "the answers." I don't think it's a question of government spending as a percentage of GDP, but more a question of government spending in excess of productive capacity. I do recognize that is a "fuzzy" concept and there are disagreements over the utility of measure like the output gap and unemployment rate (two measures of economic slack). Also, I am wondering if net inflation isn't really the true concern. As we have seen over the last ~decade, real income growth has stagnated for many people. If, however, income inflation was comparable, equal to, or greater than price inflation, I'm not sure that's a problem. I don't think it's a question of government spending as a percentage of GDP, but more a question of government spending in excess of productive capacity. I think both of those questions gloss over an even more important question -- are the benefits of government spending (in the name of using supposedly idle resources to reach full employment) worth the detrimental effects of that spending, namely opportunity cost and the malinvestment into products/businesses/sectors that the free market wasn't supporting? I might agree with MMT'ers if the theory explains HOW and WHY the system has been and can continue to go on. That gets pretty murky. Are all private sector endeavors successful? Are all public-funded projects failures? Will the private sector take up projects that may be beneficial but not short-term profitable without government inducement? For example, would we have seen the same level of fuel efficiency increases if there were not government-mandated goals? I think you can make lots of reasonable arguments for varying sizes of government spending and activity, but not based on the idea that it will drive the US bankrupt because we will run out of US dollars or because there will be a run on our bonds. There is no "free market" in the developed world because contract law and its enforcement, by definition, is a distortion. Focusing on the operational analysis side of MMT (the way the US monetary system actually operates in a sovereign, free-float exchange), whether a particular proponent believes in top-down control and inflation or limited government and minimal regulation is immaterial. That's like saying, "if they think that speed limits are a good thing, I reject that engineer's understanding of physics." You can decide the government is a parasite and anarcho-capitalism is a better concept, but that has very little bearing on the way the economic and monetary system we actually have today works. Said another way: imagine a very politically active pro-Democrat attorney who had an excellent grasp of patent law. You can't (reasonably) reject his understanding of the law because you disagree with his politics. On the other hand, you can reject policy prescriptions like the jobs guarantee which basically says that, instead of paying people to do nothing (i.e. collecting unemployment benefits) we should use them as day labor and pay them a minimum wage like $8/hour to do something: cleaning parks, cleaning roadways, working in soup kitchens, etc. I can find all kinds of problems with the jobs guarantee, but it doesn't change the fact that the bond market operates as an interest rate setting mechanism, not as a funding source for government spending or that most of the government-sector debt is actually private-sector savings, etc. Not only would we have likely seen the same level of increases, I'd argue that the advances would have come without (or at least without as much of) the accompanying costs that are inevitable when government attempts to control prices (for example, see: 1988 FTC study predicting significant economic costs and increased overall fuel consumption if proposed MPG standard were raised). With regard to your more general questions, yes, I'd argue that private sector endeavors are all successful in that they efficiently (not perfectly, but still efficiently) direct resources into the areas with the most demand. The feedback mechanism of the free market limits the waste of valuable and scarce resources by curtailing unprofitable behavior. Government-funded projects and businesses, on the other, are largely immune (or at least shielded) from the direct feedback the market provides. Need we look further than Amtrak or the Post Office to see how constant and repeated government cash infusions keep afloat unprofitable operations that would have long ago closed shop, whether in outright bankruptcy or via absorption by more profitable competitors? I think you can make lots of reasonable arguments for varying sizes of government spending and activity, but not based on the idea that it will drive the US bankrupt because we will run out of US dollars or because there will be a run on our bonds. Sure, no problem with that. Again, my problem with government spending in general is focused entirely on opportunity cost and the valuable and scarce resources wasted on products, businesses, and sectors entirely out of proportion with actual consumer demand. I take some minor umbrage with your use of "free market" as it's too theoretical for my taste. Between contract law and monopolies/oligopolies/cartels, I don't know in what way a "free market" actually exists in most developed economies. I will have to read the FTC document on fuel economy, but I think I could sympathize with a general reduction or elimination of government inducement in most sectors or businesses. I would have to give a lot more thought to the role of government spending as it relates to the military, the space program, infrastructure and other areas that have benefited the nation but that private money may not have moved in to on their own. Where I really struggle is with regulation. I know Jason likes to talk about private regulation via examples like certification facilities for mechanical or electronic components but it seems like those certification groups always end up with 1-3 major players in their fields. That's an oligopoly. I guess that could be better than a monopoly, assuming they are less beholden to the industry covered than Federal regulators are. Jason also likes to talk about politicians having a high concentration of sociopaths... The last time I checked, the second highest concentration was among corporate executives. A great example of real anarchy-capitalism seems to be Bithlo, Florida. After the Great Depression, it fell in to financial ruin and basically existed without a town or city government until the 1980s. In the 1970s, an entrepenuerial sort decided to open a recycling center but instead of bothering with the costly endeavor of actually recycling those used batteries, motor oil and other hazardous materials, he just dumped them on the property. No real government, no real regulation, no real check-ups. Because it is a relatively rural area and existed without much of a government, there was never much infrastructure put in. That means not much in the way of sewers, so many residents use well water. No real public transportation, either, so many people don't have vehicles to get them to jobs in the "big city" of Orlando. When they try to ride bicycles, they do so on a stretch of four-lane divided highway with no sidewalks and no bike paths - so plenty of fatalities. There seems to be a significant number of people with health problems (no stats because no real government studies on the problem and what private sector group is going to bother studying that?) among those using well water. Many don't have vehicles, no public transportation and bike rides of death = call 911 for bronchitis. That's not a hypothetical Crusoe Island - that's a real place. A free market it one wherein the gov't enforces contracts and anti-fraud laws, but doesn't write economic interventionist laws. Said laws will always tend to favor the big players and produce what the lobbyists want. One of the marks of a free market is *free entry* of new competitors. Low or no regulations that make it more difficult for new entrants. There are various degrees of freedom in various industries. The financial and health care industries are very un-free (heavily regulated), while the electronics and turbocharger and coilover industries are very free. Why would you think that gov't positions of power are less attractive to psychopaths than corporate exec positions? A great example of real anarchy-capitalism seems to be Bithlo, Florida. I'm not suggesting anarcho-capitalism here, I'm suggesting the gov't get out of the currency business. When was the last time the US government was "out of the currency business?"